Mühltal, May 7, 2018 - DATRON AG (WKN A0V9LA), provider of innovative CNC milling machines, dental milling machines, dosing machines and milling tools based in Mühltal near Darmstadt, announced today that it has established a focus company in the field of tool development and tooling Founded manufacturing. The new DATRON Tool Technology GmbH will deal with aspects of research and development around high-speed machining with subsequent product patenting and manufacturing. The new company was founded in cooperation with a long-standing business partner in the field of grinding technology. The investment volume on the part of DATRON AG is initially around EUR 2 million. DATRON AG is one of the leading suppliers of compact high-speed milling machines. With the founding of DATRON Tool Technology GmbH, it reflects the growing importance of milling tools in the company portfolio. Objectives of the new foundation are the enhancement of internal technological know-how, the strengthening of their own market position and the expansion of successful patenting activities in the field of high-speed cutting tools. 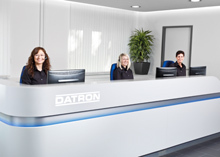 At DATRON Tool Technology GmbH, the company bundles the milling and grinding expertise of leading know-how carriers in order to achieve the greatest possible customer benefit. Their expertise is based on many years of in-house research and development work, also in cooperation with leading practice-oriented institutes such as the PTW of the TU Darmstadt and successful grinding technology partners. The new company is expected to be productive in the first quarter of 2019. "With DATRON Tool Technology GmbH, we are creating a central point within the Group, which bundles wide-ranging experts from within and outside the company at one interface. We experience additional benefits through the cooperation with another experienced partner company in the field of grinding technology. The business unit of high-speed milling tools will receive a further boost from this new company. With this start-up we are redefining key aspects of Agenda 2025 "commented Dr. Arne Brüsch, CEO of DATRON AG, the reestablishment on May 7, 2018.